The below maps shows Cealtra’s movements based on satellite data. All information and maps courtesy of the Golden Eagle Trust. 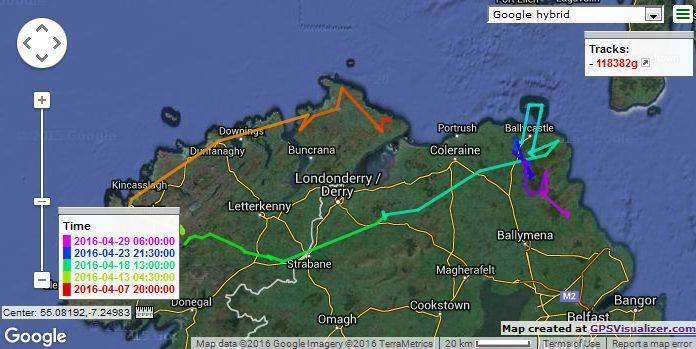 Last time I posted on the exploits of Cealtra, the 2015 Mountshannon WTSE chick, she had moved up north in Spring 2016 and was exploring first the Antrim coastline, including Rathlin Island (20 Apr), then NW Donegal where she visited Tory (6-7 June) amongst other places. Later that month she settled on Lower Lough Erne where she remained for the next 3 months, getting to known the many islands and shore of this beautiful lake system in Co. Fermanagh. Just when it looked like she had settled Cealtra departed Lough Erne for the hills of Donegal (11-13 Sept) where she still remains, mostly in the Blue Stacks but also occasionally visiting Glenveagh National Park. She is still a young immature bird…(plumage wise and not necessarily in her behaviour!) so still has plenty exploring to so before she settles down, most likely by late 2017/early 2018. It will be interesting to see if she makes a return trip to her native Lough Derg before the winter is out! …and Cealtra (2015 wild bred juv WTSE from Mountshannon, Co. Clare) also keeps on exploring the whole island, moving from Donegal into Northern Ireland in the last couple of weeks including a day trip out to Rathlin Island off the north Antrim coast on 20/4! Amazingly a 2nd untagged and apparently unringed juv WTSE was seen and photographed on Rathlin thee days later on 23/4 (thanks Neal Warnock!). While we can’t rule out an unringed Scottish bird at this point this could well be the same juv WTSE seen on Lough Swilly (19/3) and the Inch Levels, Donegal (2/4), and may have originated either from nests in Killarney, Co. Kerry, or south Galway. Shows the great value of tagging as we would have been able to identify the individual from the excellent pics! As a follow up to the last post on Cealtra (Moutnshannon 2015 WTSE juv) well she kept on going up through Fermanagh into Donegal. Lots of good habitat on the Inisowen peninsula inc Loughs Swilly and Foyle, a place that seems to be something of a magnet for WTSEs over the years…or maybe at least partly down to a few dedicated raptor people there reporting birds over the years….thanks Martin Moloney! Wonder if she is familiarising herself with the first golden eagles up there? A not uncommon sight in Scotland but only a few lucky folk in Donegal are likely to have witnessed both our reintroduced eagle species together in the same view, even better when both are Irish-bred and reared birds! Both species would have had historical breeding sites in this part of Donegal. Would that it may be so again in years to come. Just shows how much we’ve lost in the last 150-200 years and sadly we have long got used to a ‘land without eagles’ as the norm, and the population described by Thompson at that time was among the last as they were more or less gone 50 years later….thus Thompson goes on…..“Of the number 13 or 14 eagles killed at the Horn within 4 years all but one individual were Haliaeetus albicilla”. Lets hope that Cealtra and may more like her will go some way towards reversing the demise of ‘an Iolar Mara’ !! 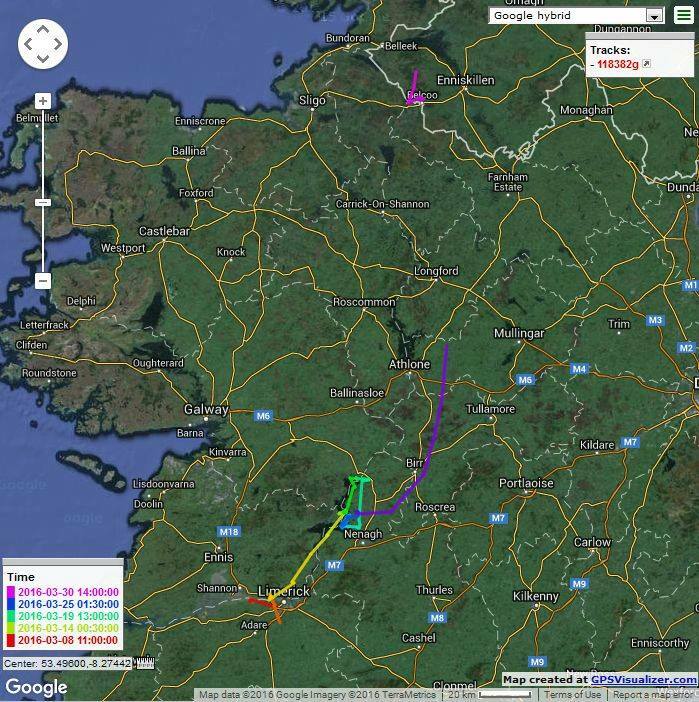 And she’s off…..having checked out the sunny South-east looks like Cealtra, the Mountshannon 2015 fledged WTSE, wants to see what the other end of the island looks like. Having spent the last 16 days back ‘home’ on Lough Derg (during which time she never visited her natal area once but largely stayed on the Tipp side of the lake) on 28 Mar she headed north on a mission. Traveling north through Offaly into Westmeath she roosted for the night near the small village of Gortmore, about 12km east of L Ree. Next day she kept on north although no GPS locations came in for that day after 0400 (hence the break in the track on the map). However that day she was actually spotted by a keen eyed observer (thanks John Murphy!) 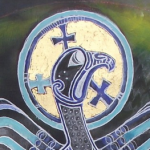 at Keenagh, Co. Longford, and she roosted that night in SE Fermanagh on the shores of Lough Macnean near Belcoo. Last location for her was on Weds 30th Apr in the hills west of Derrygonnelly………may she travel safely! PS: Interestingly one of our untagged juv WTSEs was spotted on 19 Mar on Lough Swilly, Co. Donegal and later, on 22 Mar, a juv was seen on Lough Erne, Fermanagh, possibly the same bird….thanks Martin Moloney! Cealtra, the 2015 WTSE chick fledged from a nest Mountshannon, Co. Clare, in July 2015, finally began to move away from Lough Derg in the last two weeks. Up until recently most of her movements have been around the nest area on Lough Derg with no movements “inland” away from the lake shore apart from short flights. On 31 Oct she moved west onto the slopes of the Slieve Aughty hills bordering Lough Derg. From there she moved further west towards Lough Graney and then north into south Co. Galway in the last few days. It’ll be interesting to see whether Cealtra makes her way back to Lough Derg. Last year’s (2014) WTSE juv Aoibheall followed Lough Derg north and then along the Shannon so it will be interesting to see if Cealtra does something similar. Most major movements of released WTSEs that we know of, especially the satellite tagged birds, and young Irish-bred eagles have been north rather than any other direction. This is also the case in Norway where the large number of satellite tagged young WTSEs show northward movements on dispersing from the nest area. Thus there appears to be a hard-wired genetic predisposition to disperse north of Irish birds, whether of Norwegian origin or parentage but Irish bred. Young birds do return south toward their natal area in future years before settling to breed but the overall shift in the breeding population over time appears to be north. This includes birds that we know are now breeding south of the Killarney NP release site, apart from a few notable exceptions that apparently moved only short distances (<50km) before settling on territories. 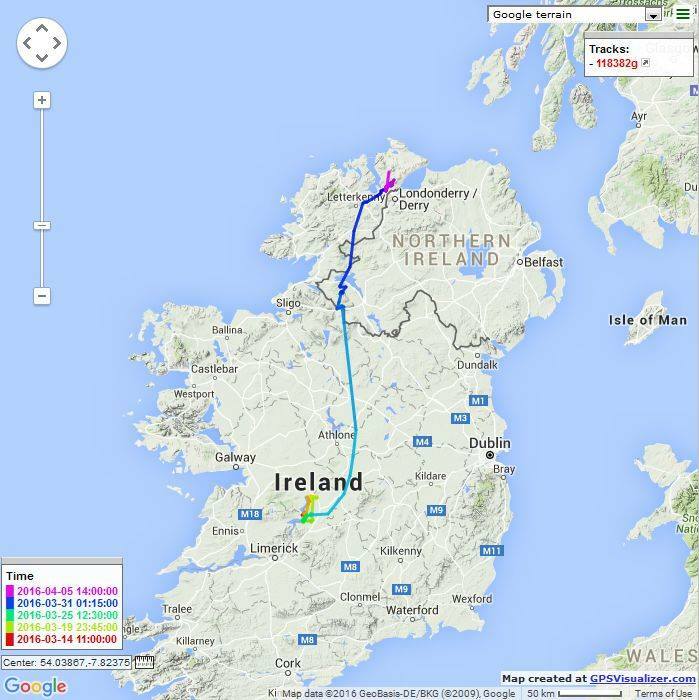 Cealtra, our only satellite tagged sea eagle chick from Mountshannon, Co. Clare, has been steadily exploring within a few kilometres of her nest on Lough Derg, initially travelling a few km east along the shore of the lake but recently flying some 5km to the Tipperary side and back. Apart from the nest island she has been roosting on some of the other islands nearby and even visited Inis Cealtra (Holy Island)…..well she had to didn’t she! Over the last couple of weeks she has put in fleeting appearances to the nest island in Mountshannon bay so today (13/9) the Bird Information & Viewing Point on the pier in Mountshannon was closed for the winter…..hard to believe it’s that time of year already…. Over the coming months look out for updates on Cealtra’s progress as she explores more and more of Lough Derg, and wherever the fancy takes her.